On October 4, 2014, we were delighted to take part in the 2nd Annual “Reach the Peaks” Hiking Challenge, a dog-friendly event that raises money for the local Stokes County Arts Council. This event intrigued us as we had hiked up to 2 of the peaks in Hanging Rock State Park back in 2009 and loved the opportunity to see the other 3 peaks. Although there was a timed Trail Race at the event, the hiking challenge was a hike-at-your-own-pace type event. Each participant was given a bib with their number on it as well as a challenge card. 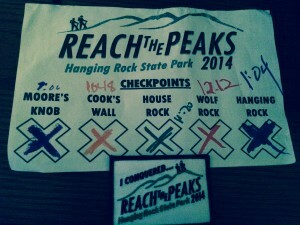 The hiker had to hike to each specific peak in order and have their cards marked off by the event official there. The time was also noted on the card. Upon completion of the challenge, each hiker presented his/her card to the Finish Line officials and received a patch marking their accomplishment. 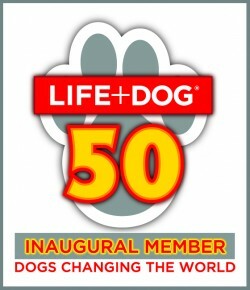 Each human participant received a T-shirt and other items as part of their registration and each canine received a lovely bandana to mark the occasion! We met many other, well-mannered dogs and their owners on the trail. Trails were very well-marked and there were plenty of volunteer staff there to help you. This year there were over 320 human and 25-30 canine participants in the 2014 hiking challenge and more are expected for 2015. The date for 2015 hasn’t yet been announced. 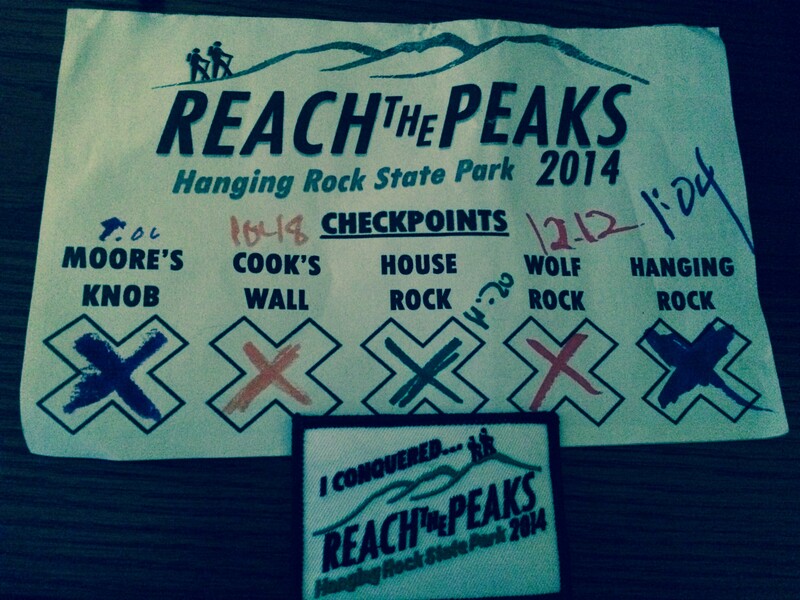 HELPFUL INFORMATION: How do I find out when the Reach the Peaks Hiking Challenge 2015 will take place? Watch the Stokes County Arts Council webpage and/or Social Media Feeds. How do I get there? Camera with plenty of memory cards! Arrive EARLY! The event started at 730 AM and the parking lot was rather full shortly thereafter. There were over 300 human hikers on the trail last year and the trails got rather crowded as the day went on. Fill your tank up near one of the Interstate exits as the roads to Hanging Rock State Park are mostly country roads with few stores/gas stations. Bring all your snacks and drinks with you from home or purchase near the interstate system for reasons noted above. Allow PLENTY of time to take in the awesome views from each of the Peaks and plan on having lunch on one of them. (Another reason to arrive early is that you’ll have more of the peaks to yourself early on). After your trip, check yourself carefully for TICKS as you will be going through brush/woods.